One of my life ambitions had been to see and photograph all of the world’s big cat species in the wild. I already had the relatively easy ones under my belt – tiger, lion, leopard, jaguar, cheetah, and puma – which meant only one remained. The snow leopard is the epitome of remote, rugged wilderness and has for so long been regarded as a mythical ghost of the mountains: a creature that lives unseen among the snow-capped peaks of the Himalayas and Central Asia. However, over the past decade a handful of locations in the Himalayas have begun to reveal regular and reliable sightings, which naturally alerted my interest. I began planning my first trip over two years ago and in anticipation one of the first decisions I made was to trade in my Nikon 500mm f4 for the 600mm equivalent. This of course had consequences, as the 600mm weighs over 1100 grams more. My trusty RRS TVC-34L tripod was still plenty beefy enough, but I soon found the RRS BH-55 ball head (with quick release plate) could at times be a little awkward. It was plenty strong enough to hold the weight of the lens/ camera combination, but I found so much extra care was needed to keep control of the lens when trying to follow a moving subject. RRS had the perfect solution – their new fluid full gimbal head (FG-02). 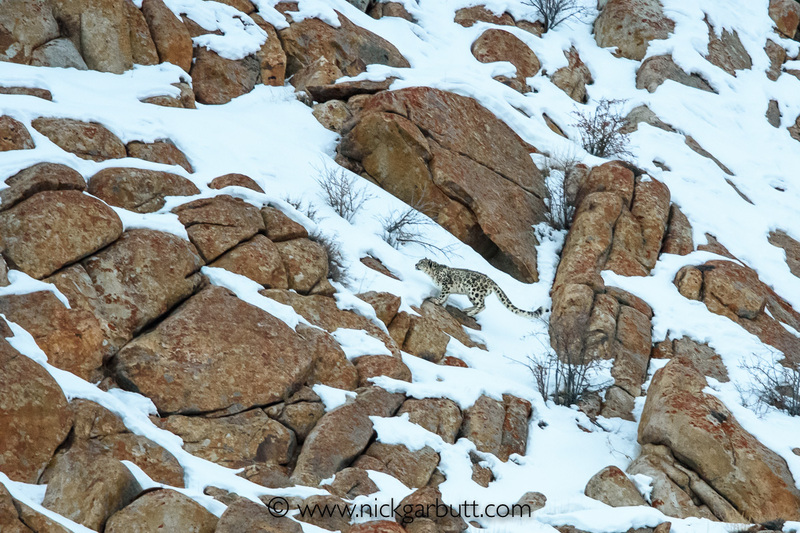 Winter is the best time to try and see snow leopards as the harsh weather forces grazing and browsing animals like Asiatic Ibex, Urial and Bharal (both types of wild sheep) to lower altitudes. 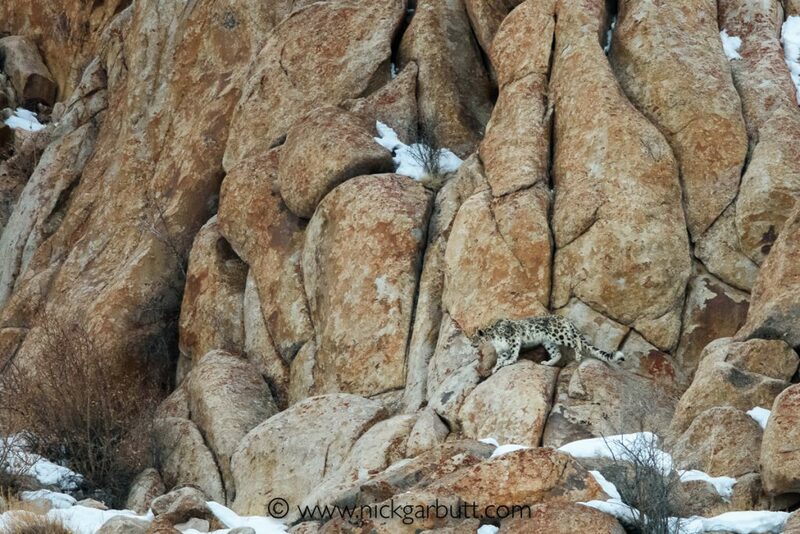 These are the main prey of snow leopards, so they too follow to the lower slopes. So, in February this year (2017) I traveled to Ladakh in northern India to try and fulfill my ambition. 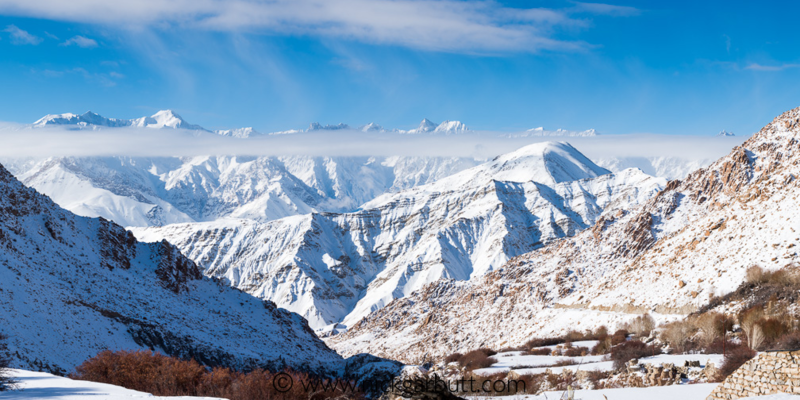 After flying into Leh and spending a couple of days acclimatizing to the thin air (Leh is around 3500m (11,500 ft) asl), I traveled on to the Zanskar Range of the Himalayas that lay to the west and my base at the head of a secluded valley laying at around 4100m (13,500ft). Here, with the help of trackers from the Snow Leopard Conservancy I was to look for the cats. Long periods were spent scanning the high slopes on either side of the valley with telescopes. 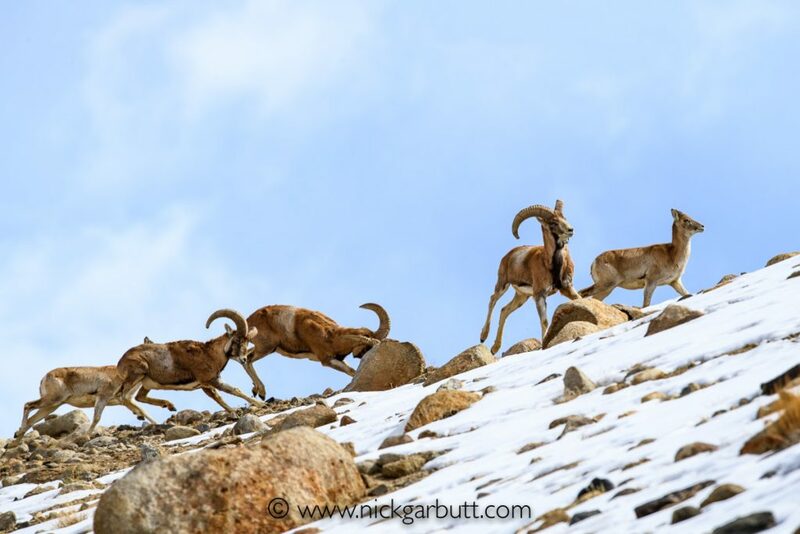 The three guides had remarkable vision and their unaided eyes picked out the movement of ibex on steep snowy cliffs several hundred meters away that I struggled to see with binoculars. I felt certain they’d find a cat if there was one in the vicinity, but I wondered how likely it was that I’d be able to see it. Our first sighting came on day three, but it was so distant on a far peak way up the valley that I struggled to see the animal even through a telescope, let alone take a photo. This hardly constituted the fulfillment of my ambition. The next opportunity came two days later. I went out before dawn into the freezing air to set up a time-lapse sequence of the sunrise on the mountains. 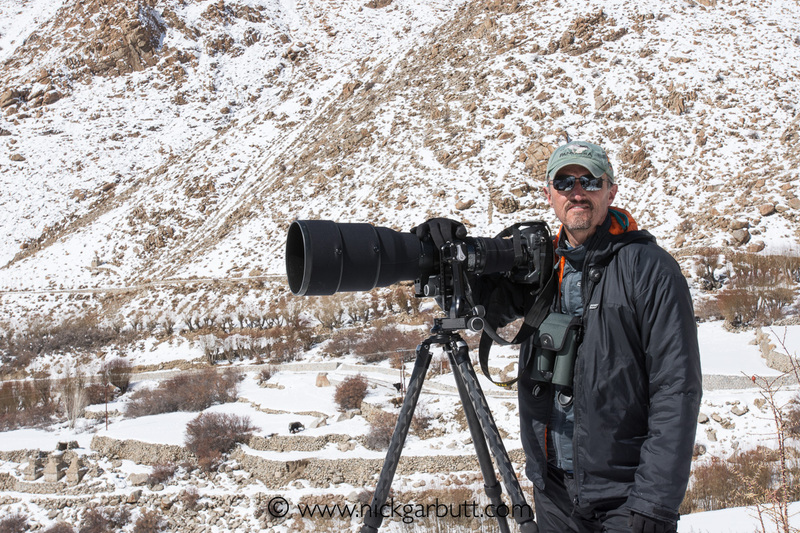 An hour and a half later, around 7:30am I returned to collect my camera, and suddenly heard the unmistakable call of a snow leopard – a deep guttural meow – coming from high on the ridge to my right. I rushed back to base to find the guides already onto it, tracking the cats’ movements along the ridgeline. 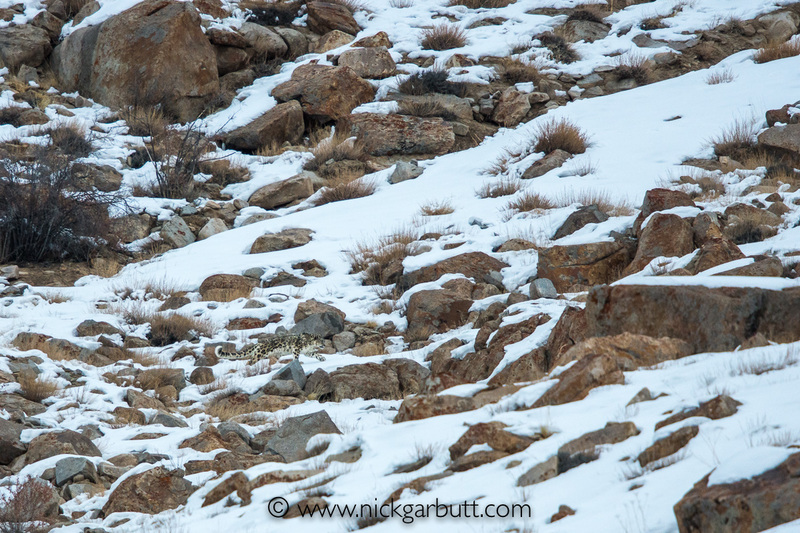 The snow leopard was again quite far away, but gradually it moved a little closer and I was able to take some record shots that at least clearly, but distantly, showed the animal moving across a snowy slope. Then we saw a second cat and the pair moved further along the ridge together: February and March is mating time and this was almost certainly a courting pair, hence the distinctive calls heard earlier. What turned out to be my final opportunity came a further three days later. In the afternoon the guides took me higher up the valley to a vantage point where ridges on both sides were visible. 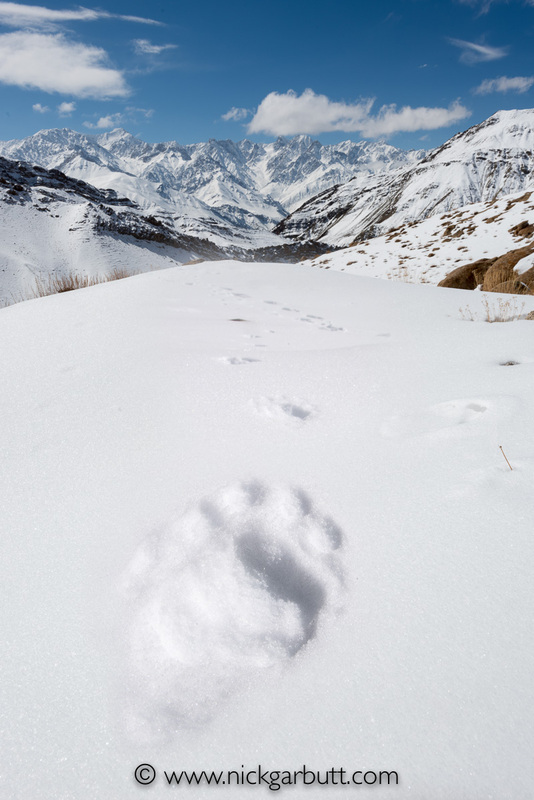 Earlier in the day they had found pug marks (foot prints) – almost certainly of the courting pair – and they were confident the cats were still somewhere at the head of the valley. After two hours of combing the slopes using telescopes there were no apparent signs. Undeterred the guides continued their searching and once again began looking closely at the slopes slightly lower down the valley. 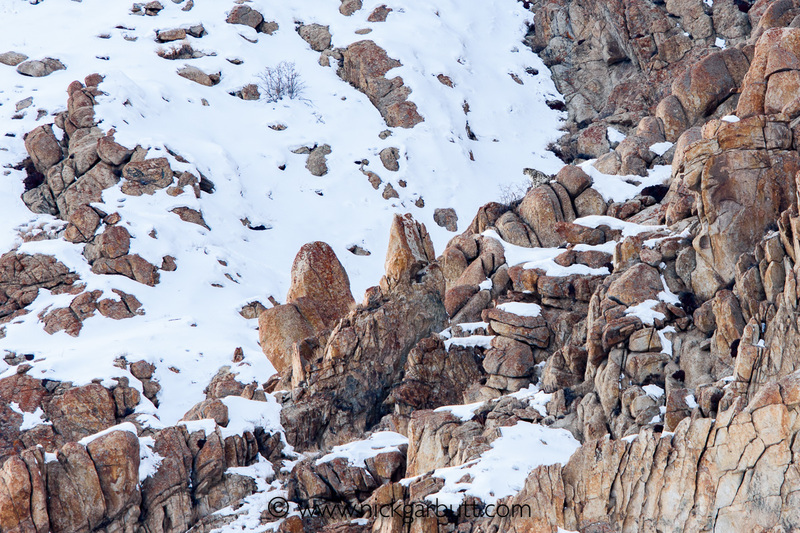 Ten minutes later they found a snow leopard – probably the male, sitting on a prominent rock overlooking the valley on the opposite side from our position. The guides knew straight away, our best chance of getting closer for photos was to descend back down the valley to an alternative position in anticipation of where the cat was likely to move. I took a couple of distant shots for insurance. 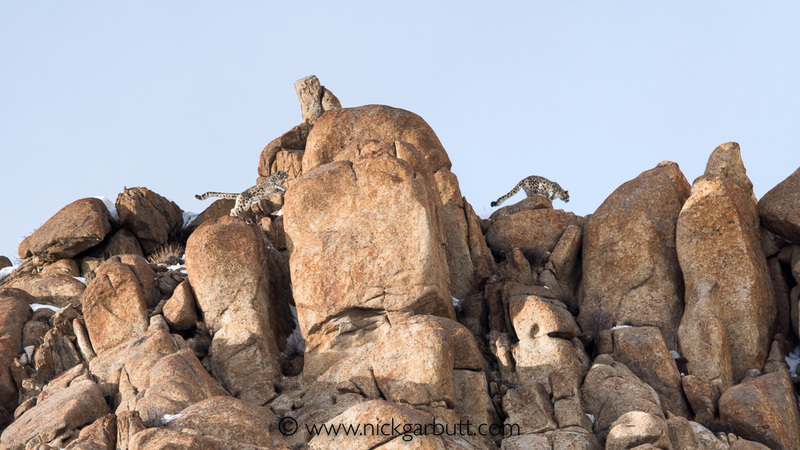 By the time we were back in position lower down, there were two snow leopards visible – the pair were back together and seemed to be playing a game of hide-and-seek amongst the rocks on the ridge. Then the female moved off and disappeared and the male sat for a while looking over the valley. He then climbed down and began descending the slope roughly in a direction towards me. 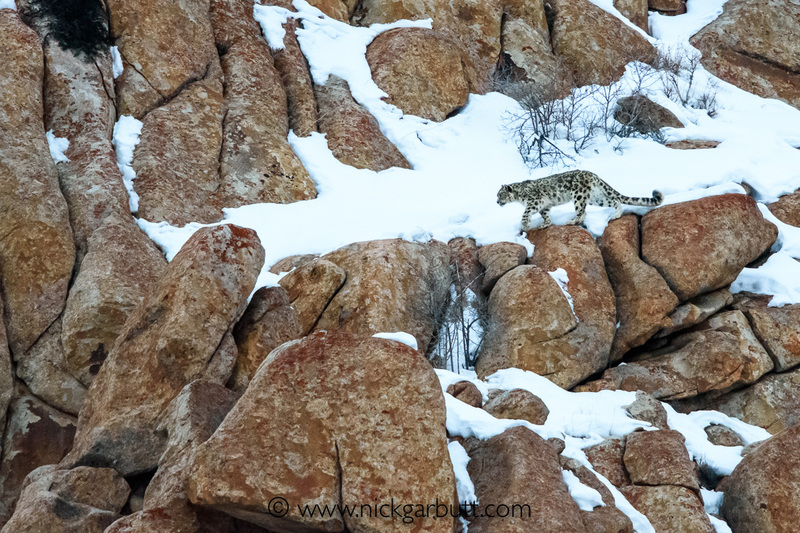 As he picked his way through the boulders and snowy patches it was so difficult to keep track, as his camouflage was so good. 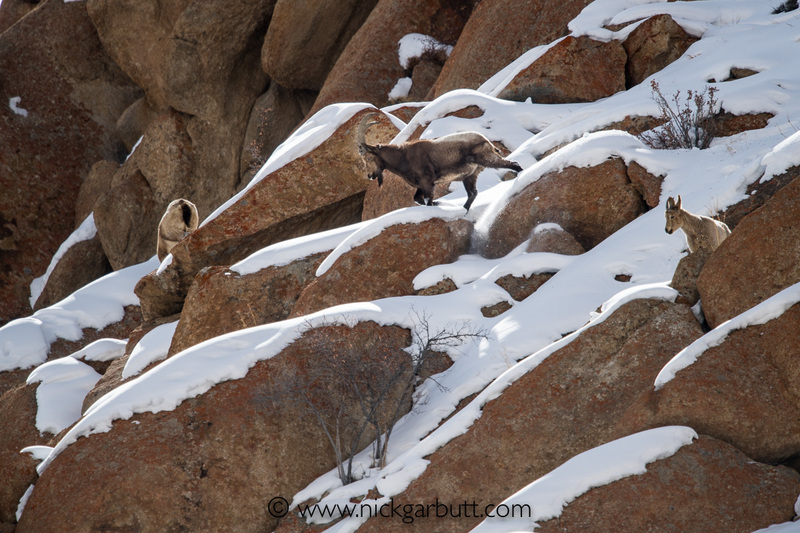 Once I’d found him in the viewfinder, I didn’t dare take my eye away from the camera and was able to gradually move with him as he continued to descend. The smooth balanced movement of my 600mm, 1.4x converter combination on the RRS gimbal head undoubtedly helped hugely here – without it, I doubt I’d have been able to keep the animal within my sights. By this point I was rattling off shots and because dusk was descending too, I was constantly checking and increasing the ISO to maintain a realistic shutter speed. The snow leopard came within perhaps 400m, and then traversed the slope before climbing higher onto another ridge. In the half-light of dusk the last I saw of him was a silhouette on the skyline before he disappeared over the other side. The final hour had been an intense bout of concentration and excitement, with adrenaline coursing my arteries. In such instances, I never feel more alive and the feeling is as addictive as any drug. Which is exactly why I intend returning for more. 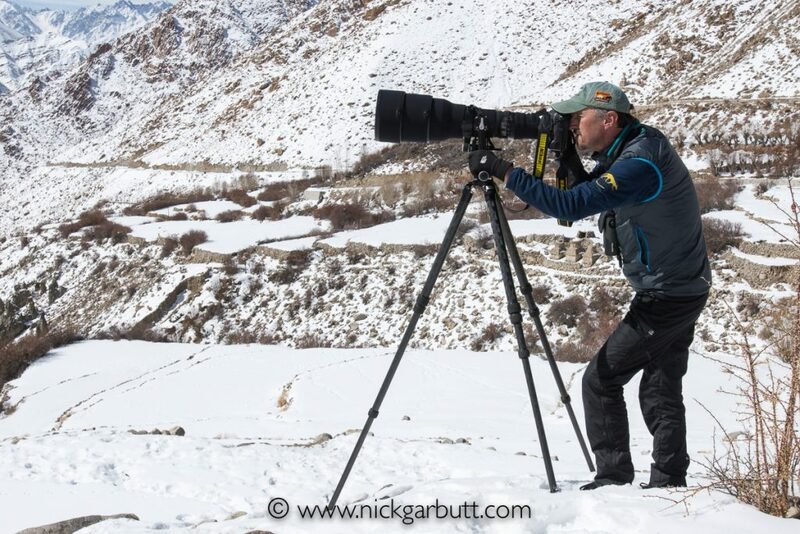 Nick Garbutt is a UK-based wildlife photographer who organizes photography tours and safaris worldwide. He will again be running snow leopard trips to Ladakh in 2018 and 2019. For more information visit www.nickgarbutt.com. I know this is a RRS blog, but Wimberly has been making a Sidekick gimbal mount which fits into my BH-55 ballhead perfectly and gives a nice fluid movement to follow your subject, be it birds, leopards or planes. I’ve been using it for 10 years.. which means I’ve had a lot of shots taken with the setup, for far longer than the RRS gimbal has been available… What I like about the wimberly, and don’t about the RRS gimbal (which I haven’t tried) is that the former is nicely sculpted and fits reasonably well in my backpack or bag, whereas the more angular RRS gimbal looks longer and being more angular needs a bit more space. I respect RRS’s quality but sometimes in terms of design someone else has made it better. If I have to make a criticism of RRS stuff, is that it clings to it’s mecano-set type of build, and bar it’s L-brackets, makes everything so chunky and angular! make stuff that fits into our bags please! Oh.. I’m based in Africa, and no, I’m not affiliated with Wimberly at all. I DO appreciate well-designed products (such as the BH55! ).